Our first day out in Istanbul is a visit to Topkapi Palace which is less than 10 minutes walk from Star Holiday Hotel. On the way, you’ll walk through Sultanahmet Park and walk past the Blue Mosque and Hagia Sophia. The main entrance (Imperial Gate) by the side of Hagia Sophia fronting the non functioning Sultan Ahmet III fountain, will take you to the Palace first courtyard. No entrance ticket is required yet. The main entrance (Imperial Gate) as seen from Sultan Ahmet III fountain (right). A closer view of the main entrance (Imperial Gate). Construction of the Topkapi Palace started in 1460 and completed in 1478. It became the administrative centre and residence of the imperial Ottoman court. About 30 Sultans ruled from the Topkapı Palace from 1478 to 1856. After the establishment of the Republic of Turkey, Topkapi Palace, was transformed into a palace-museum in 1924. It is reputed for its architectural structures, antique collection and approximately 300,000 archive papers. Once you pass the main entrance, you’ll be in the first courtyard. It is the largest of the courtyards. Hagia-Irene, formerly a church served as an armory during the Ottoman period and the other service buildings like the Mint, Oven and Hospital are located here as well. Hagia Irene or Saint Irene church, now a museum in the first courtyard. 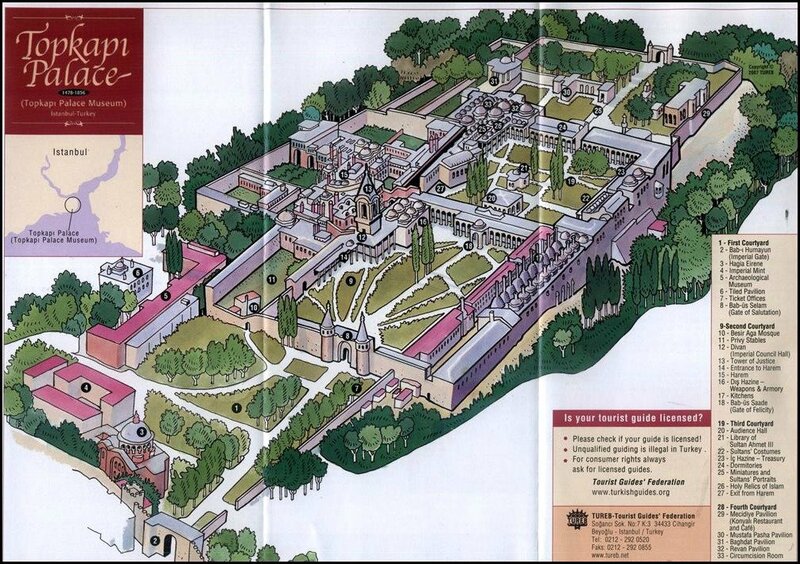 The entrance fee to Topkapi Palace is 40₺. Tickets can be bought from the ticket office inside the first courtyard else, e-tickets are available here. You scan your ticket upon entering the second courtyard after security check. Topkapi Palace has four courtyards, each serving different purpose with passages connecting each other. It is surrounded with greens and gardens for which, the Gulhane Park, now open to public was once part of the palace grounds. The four courtyards represented graphically. The second gate has two guard towers called “Gate of Salutation”, which leads to the second courtyard. This was the administrative centre of the palace. The Tower of Justice, to the left is a watchtower dating back to the 15th century, is the tallest structure within the palace. The Imperial Council Hall where the Ottoman Empire was literally govern from, is in-front of the Tower of Justice. The palace kitchens and confectionaries among others, are located here too. “Gate of Salutation”, the entrance to the second courtyard. The ticket office is to the right. Scan your ticket at the turnstile after security checks inside. Model of Topkapi Palace after the turnstile. Tower of Justice at the back. Imperial Council Hall in-front. Frontage of the Imperial Council Hall. Sokhumi Fortress inscription. The inscription originally belonged to the Fortress of Sokhumi on the Black Sea later brought to the Topkapi Palace grounds. All paths in the Second Court will lead to the “Gate of Felicity” that gives access to the Third Courtyard. It houses the private residence of the Sultan and the palace school. This is the Sultan’s private domain where he spent his days. The Chamber of Holy Relics located here, consists of repository for Islāmic relics, including the mantle, sword, and bow of the Prophet Muhammad (PBUH). Housed in the Pavilion of the Conqueror, is the palace’s most famous collections of imperial jewels. The Library of Sultan Ahmed III, is situated behind the Audience Hall. “Gate of Felicity” leading to the third courtyard. Audience Hall just after the Gate of Felicity. Attire of Fatima, daughter of Prophet Muhammad (PBUH) displayed at the Holy Relic chamber. Benches to rest in the third courtyard. Autumn flowers in the third courtyard. A sort of burned out tree trunk, but the tree survived. The fourth and last courtyard of the palace consists primarily of private terraced gardens and pavilions of the Sultan. From here, he has a great view of the city overlooking the Golden Horn, Bosphorus Straits and Marmara Sea. Many of the Ottoman Sultans had an interest in flowers and gardening, and the fourth courtyard gardens are filled with tulips or roses depending on the season. Autumn roses in the fourth courtyard garden. View across the Marmara Sea from Topkapi. This was our second visit to Topkapi Palace, the first being 2013. Nothing much has changed since. You wouldn’t miss much thus, you might want to utilise the 40₺ entrance fee for other attraction elsewhere. This entry was posted in Istanbul, Istanbul-2017, Topkapi Palace, Turkey and tagged bercuti ke Istanbul, blog percutian istanbul, cuti-cuti Istanbul, istana topkapi, Istanbul travel blog, jalan-jalan Istanbul, kembara Istanbul, liburan ke istanbul, melancong ke Istanbul, melawat topkapi, percutian Istanbul, Topkapi Palace on 30/03/2018 by admin. Our flight home from LHR to KUL by Turkish Airlines is a stop-over flight (our choosing) instead of a transit. We’ve decided to take advantage of the stop-over lower fare compared to a transit, as it is sufficient to cover one night’s stay in a hotel. Our flight departed LHR at 11:30 and arrived IST at 17:20 local time, Istanbul being 2 hours ahead of London. We’ll be doing a 3 night free & easy, no itinerary stop-over in Istanbul. Flying over Buyukcekmece in preparation for landing into Ataturk, Istanbul. For Muslim passengers who wish to perform their prayers, there is a prayer area behind baggage carousel 11 on the arrival level. There is no ablution facilities there, but you can do so at the washroom in-front of carousel 9 & 10. If you are on transit at Ataturk, there is a prayer hall on departure level between gates 218 & 219. Prayer area on arrival level behind baggage carousel 11. Prayer hall at Ataturk departure level between gates 218 & 219. It’s facing the apron, so you do get to see aircraft movement. Although we’ve been to Istanbul several times, this will be our first taking the metro into town (otherwise it has been the airport shuttle). It’s a matter of following the sign on the floor & overhead signboard to the metro platform on the lower floor. There is lift to assist passengers with luggage, thus it’s step-free to the platform. Way to the metro platform at the airport is clearly marked on the floor and overhead signboards. Our ‘Istanbulkart’ (Oyster equivalent) purchased 2 years ago, had sufficient balance for us to drop off at Sultanahmet stop where our hotel is. Unlike Oyster, Istanbulkart can be used up to 4 persons. The first will go thru the turnstile and pass the card to the person at the back to do the same. Of-course, 4 charges will be incurred for a 4 person use. Should you require to top-up your card, there are top-up machines close to the platform. Istanbul’s version of the Oyster card. Those intending to proceed to Sultanahmet, Eminonu or right to Kabatas or in between, you’ll need to change to Tram service at Aksary. Although there is another interchange at Zeytinburnu to do so, people who we asked (non-english speaking) gestured ‘no-no’, but to get off at Aksary. One person even wrote down ‘Aksary’. No idea why that’s so. Thereafter, you’ve walk over to the Tram stop at Yusufpasa. Exiting Aksary station is step free, but one needs to cross a very busy & wide main road over to Yusufpasa. There is an underground walkway but the stairs down and then up again is taxing. We GUARANTEE those with luggage and the not-so-young will be breathless. Once across the main road, it’s a further +/- 150m to Yusufpasa tram stop. We wonder whether a transfer at Zeytinburnu, would be step free and be friendly to disabled? Useful metro/tram map of Istanbul. Trams runs frequently and you should not have to wait long for one. By the time we reached Sultanahmet stop, it was already night. We will be putting up at Star Holiday Hotel, a short walking distance from the stop. This is our 3rd time staying here and although the room is a little smallish, it’s proximity to attractions in Sultanahmet area makes choosing this hotel a no-brainier. It’s literally a 3 minutes walk to the Blue Mosque and 2 minutes, to Hagia Sophia. We’ve reviewed the hotel here. Nearby attractions or rather all attractions in Sultanahmet area, will be covered in future post. Our favorite hotel, Star Holiday Hotel. A beautiful sight of the Sultanahmet Mosque aka ‘The Blue Mosque’ seen from our room window. This entry was posted in Istanbul, Istanbul-2017, Star Holiday Hotel, Turkey and tagged Ataturk prayer room, bercuti ke Istanbul, Bilik solat Ataturk, blog percutian istanbul, cuti-cuti Istanbul, Istanbul travel blog, jalan-jalan Istanbul, kembara Istanbul, liburan ke istanbul, melancong ke Istanbul, percutian Istanbul, Ruang sembahyang ataturk on 25/03/2018 by admin.